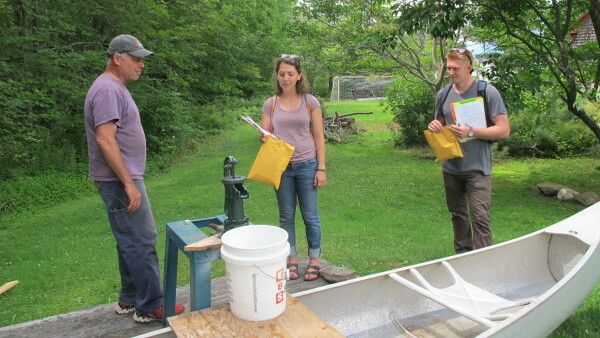 Union Street resident Joseph Larson (left) talks with Frances Jimenez (center) and Jack Martell of Environmental Health Strategy Center about the presence of arsenic in local residential wells on Friday in Blue Hill. BLUE HILL, Maine — Despite some opposition in Augusta to public funding of drinking water testing programs, a nonprofit advocacy organization is pushing ahead to try to educate the public about the importance of testing private water supplies. On Friday, three representatives of Environmental Health Strategy Center went door-to-door on Union Street, asking local residents if they’ve had their water tested for arsenic and offering to provide them with information and free testing kits. At 57 percent, Blue Hill has one of the highest rates in Maine for households with arsenic levels in their drinking water supply that exceed the federal limit of 10 micrograms per liter. Emily Postman, outreach manager for the group, said that Friday’s effort in Blue Hill is part of a pilot project to help draw attention to the issue and to build public support for testing programs. Postman said going door-to-door may help in more populated areas where arsenic levels are known to be high, but it doesn’t help spread the word to less populated parts of Maine that may be equally at risk for arsenic exposure. According to the U.S. Geological Survey, as many as 150,000 Maine homes may be drawing well water with dangerously high levels of arsenic, a naturally occurring carcinogen with several associated health risks. In the Kennebec County town of Manchester, which has the highest rate in Maine of elevated arsenic for wells, there is a better than 60 percent chance of consuming more than the recommended limit of the metalloid element. The issue of using public funds to assist citizens in testing their wells for arsenic has spurred a political debate in Augusta, where state legislators in favor of increased funding for arsenic awareness and testing programs have run into opposition from the administration of Gov. Paul LePage, who contends that government funding for testing is unnecessary. A bill that would have established a fund for outreach and education about arsenic testing, and would have offered assistance to low-income Mainers in buying treatment systems for their wells, received bipartisan support in the Legislature last month but then was vetoed by LePage. A subsequent legislative effort to override that veto fell short. Then earlier this week, the commissioner of the Maine Department of Health and Human Services, Mary Mayhew, came under fire from some legislators for denying a request by the Maine Center for Disease Control and Prevention to apply for a renewal of a two-year, $300,000 federal grant to boost the state’s well water testing rate. The previous grant, which Maine received in 2013, runs out next month. Mayhew responded to the legislators — three Democrats and three Republicans — saying that few of the free kits that have been handed out are returned to the state lab for testing and that the state should not be using taxpayer funds to compete against private firms that already offer testing services, which she said range from $30 to $90. But according to Environmental Health Strategy Center, the organization’s efforts to raise awareness about the issue and to hand out free kits is being supported by private testing labs. The kits themselves may be free, it said, but it costs $85 to process them. The nonprofit group is working with A&L Laboratory of Auburn, which has agreed to offer a 20 percent discount to homeowners participating in the outreach program. The resulting $68 cost per kit goes to the private company. The nonprofit group’s pilot project may help raise awareness, she added, but ultimately it will take a more widespread, publicly-funded effort to significantly boost arsenic testing in Maine. “We really hope that the state takes this on again as a real priority for a larger-scale [awareness] effort,” Halas-O’Connor said. Correction: A previous version of this story erroneously stated the federal limit for arsenic levels in drinking water supplies is 50 micrograms per liter. It is 10 micrograms per liter.